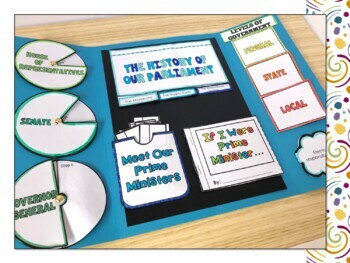 Explaining how Australia's democratic system works can often be a tricky topic to explain to primary school aged children. 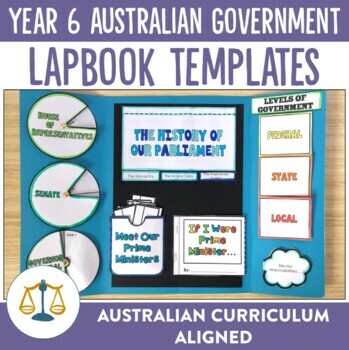 With the aide of this highly engaging Lapbook, designed to compliment the Australian Year 6 Civics and Citizenship curriculum, your students will not only begin to understand the history of this system and why we continue to use it today, but they will want to learn more as they work through the fun research activities included in this Lapbook. ☺ Australia's Three Levels of Government - What are they? Who governs? What are their roles and responsibilities? ☺ Making a Law in Australia - follow the steps. 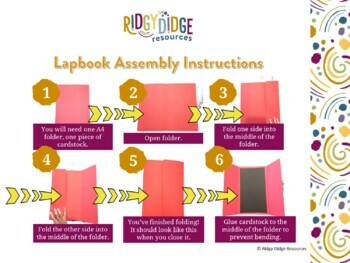 ✔ instructions on how to assemble your Lapbook as well as how to assemble each each template to go inside the Lapbook. Is there a rubric included in this resource? How long should it take to complete these lapbook activities? 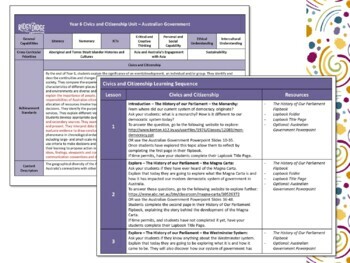 This Unit is designed to be implemented once a week over a 10 week term. Can I share this resource with my teaching partner? No. This product is for personal use only. Multiple licences are available for use among more than one person. The Unit Plan is a guide only and very simple. Teachers should use their own discretion when implementing. Some questions have been given to help guide student thinking but more specific questions should be added to develop conversation and deeper learning. Students should be encouraged to ask questions themselves as well. Please note: This Unit Plan uses the internet as a resource, therefore internet access is essential to be able to follow the Unit Plan.